It comes as no surprise to anyone who knows me, that my passion is food, the big astonishment however, if God came down right now and said, ‘ok Jax, choose a passion for the rest of your life’, I would drop food like a hot rock and pick music. Vinyl, CD’s and of course back in the day cassettes, of which I have an extensive library! And not just to listen. I was given these massive donut lips, specifically to play wind instruments and boy can I blow (!) the clarinet (let’s keep it clean people!). If you ever find me on a drunken night, don’t put a recorder in my hand. Why? You’ll see an entirely different side to me and exactly what the recorder can really do. Anyway, I’m losing focus, the reason I feel the need to mention my other passion is because in a beautiful case of ‘SNAP’ 5th Street, inspires both the majestic munchies and the melody, deep down in my soul. Cross the bridge over Moorhouse and into the land of, ‘over there’ (especially, if you live on the North side) and you’ll find this new kid on the block, conveniently sitting elegantly on the corner of Durham St South at number 5. In terms of perspective, its cousin, the award winning café Hello Sunday, is adjacent and on the other corner, Elgin St. I can be anywhere in the world, chilling, cooking, shopping or dining, and when I hear the intro to certain songs, I HAVE to dance, such is the power of the ‘good time’ ahead. Two songs in particular: ‘Wanna Be Starting Somethin’ Micheal Jackson and ‘I Feel For You’ Chaka Khan. When I have a table booked at 5th Street, as soon as I pull up on Elgin or Durham, it’s like the DJ has dropped the needle and the crackle gives me the intro to one of those songs ….. ooooh and I know I’m gonna have such a good time. Yes I ‘wanna be starting somethin’ and you know, I do ‘feel for you’. Right, let’s get down to food business and crack the hell on. Enter 5thStreet and before you’re relieved of your coat or even grabbed one of their cozy, velvet sofa’s in the bar, you’re drawn into the heart of a bespoke, inviting and delicious smelling tardis (time and relative dimension in space) type vibe. Imagine an oak panelled, private club; imagine a lush green path in an amazon forest, imagine an underground New York nightclub, imagine a bespoke Victorian hoochi club. To me, 5th Street, is a veritable feast for the eyes, dark, tactile moody, yet light, colourful and spacious with so much to take in. 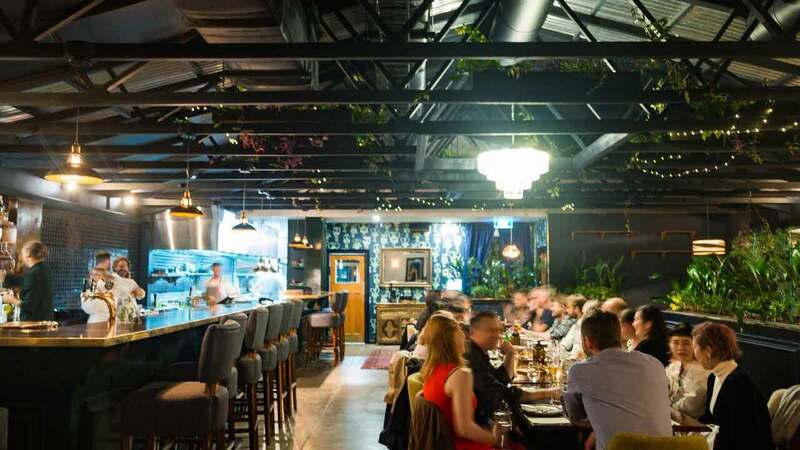 As a perfect match, the team in this modern, funky, contemporary establishment pull you in with their joie de vivre. Chris on the door, Wynn on the floor. In the bar, Ezra tipping his hat and if you’re lucky as f@@k, you get to sit at the Chef’s table and enjoy the captivatingly mouthwatering delights of Max and Joe (hey ho and we haven’t even started eating yet), while they create service in front of your eyes. And ladies, there’s more to service then meets the eye #nahmsayin! 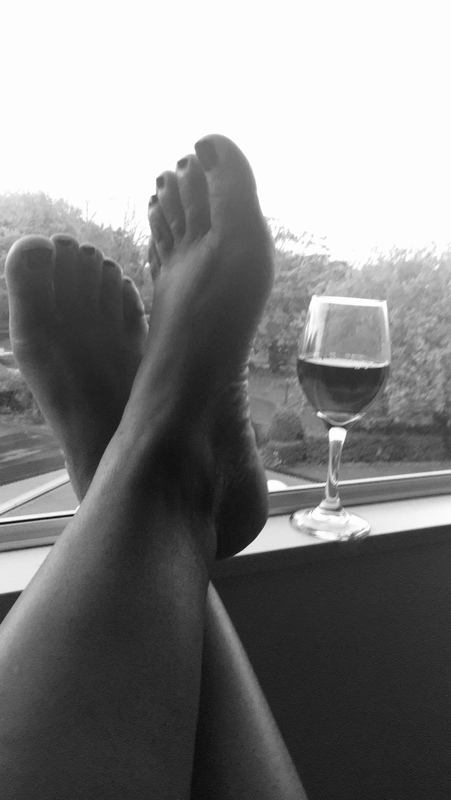 The reason I’m skipping to the front door of course is the food, the food, the food, the food…. where shall I even begin. 5th Street offers a bounty of plates from Small to Medium and of course Large, but it’s all about being social and ‘sharing’. The variety is exceptional and the grub, top notch dining, yet doesn’t hit hard on the pocket. 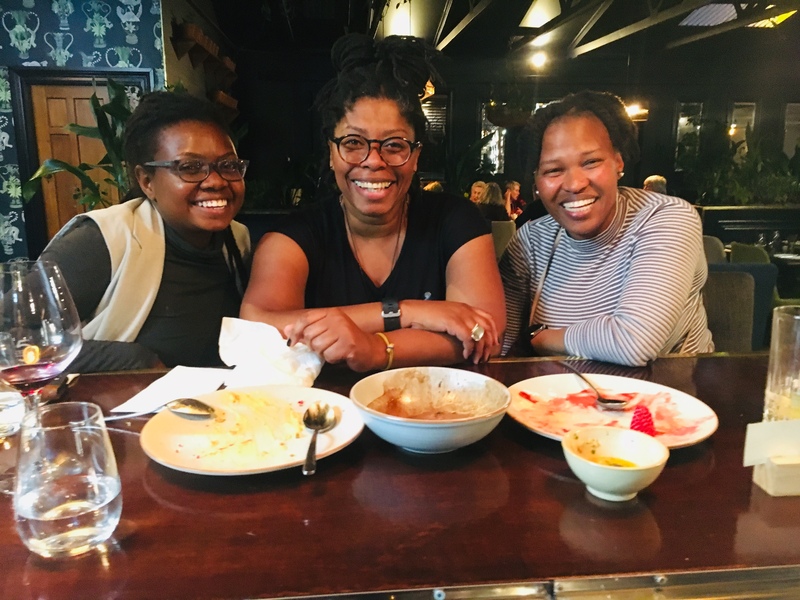 Recently, some mates and I found ourselves giggling like school girls, perched on the tall bar stalls drooling over the chef’s service, dining large, as in we shared many, many plates of food together. Thanks for the pic Max. 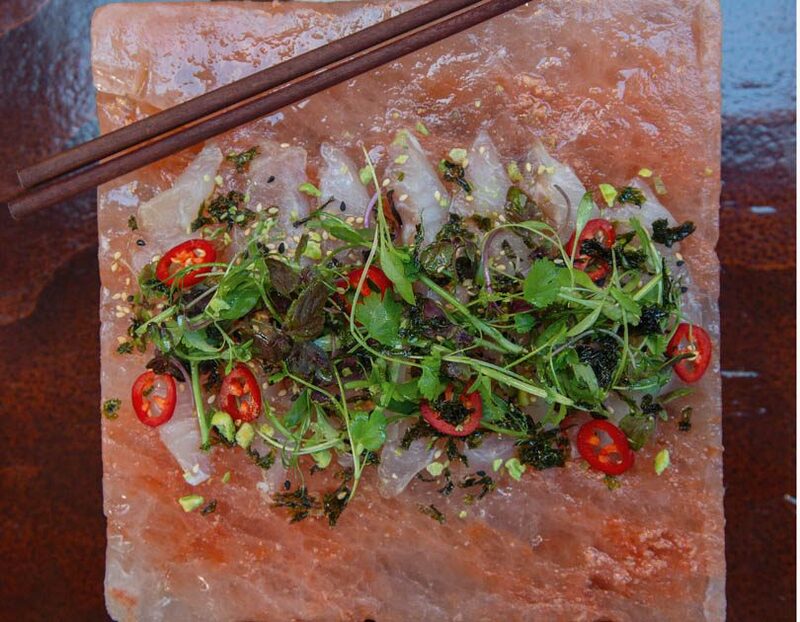 Ok, let’s get stuck in: a menu favourite and 5thStreet classic is the salt blocked, cured fish with ponzu, fresh chilli, toasted garlic, sesame and shallots. Beautifully presented, on a block of Himalayan salt. This dish is fresh, inviting and creates such a wonderful palate opener on which to receive and welcome all else ordered or presented. Ask Wynn, the Maitre De to suggest a wine match and let me tell you people – you are in fishy heaven. Also from small plates, the Korean sticky fried chicken with coriander mayo, crispy on the outside; juicy and moist on the inside is a winner, winner as chicken dinners go. Just enough to share with friends, OR not as the case happened to be, but wait there’s more. 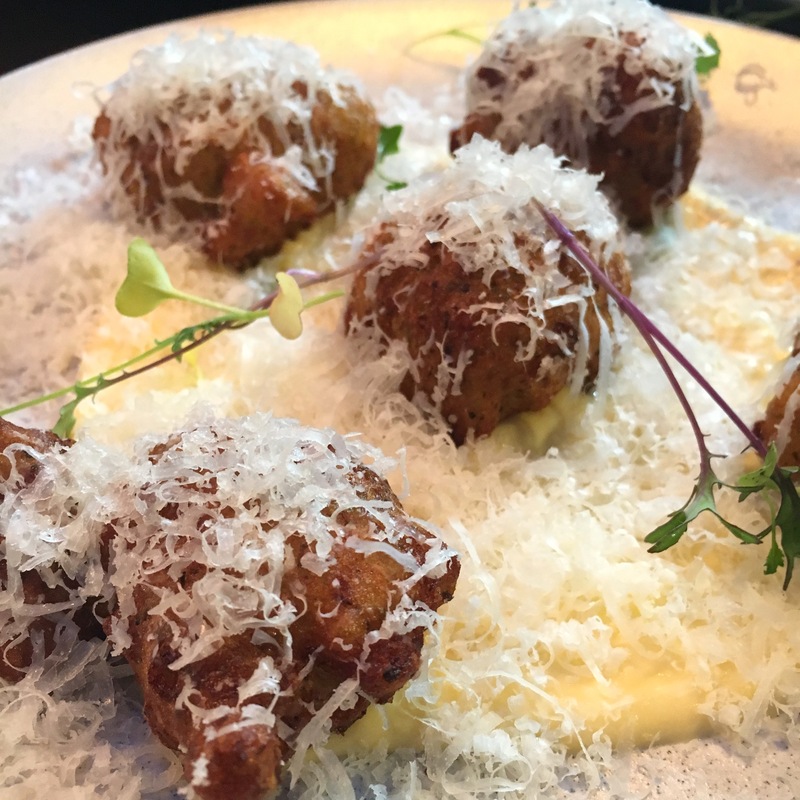 Broccoli doughnuts with cheddar custard and shaved manchego…. that’s all I have to say on these crispy little pillows of wonderfulness. Order the pan-fried prawns in chipotle butter, lime and focaccia and when your work mates ask you the following day why your mouth is watering, while you stare at the ceiling, just bring their focus to your memory of the softness of the charred bread, used to wipe the plate clean of the incredible sauce and they’ll understand. They’ll understand. Medium plates: I know, we ordered loads and there was nothing left people, NOTHING – plates clean. So, the mushroom medley with seaweed butter, crispy nori & Asian greens. A mammoth plate of sensations that burst in your mouth with flavour, texture and mushroom love. If you’re a vegan or even if you’re not, this is not a plate to wonder about, order it and enjoy. From the large plates another 5thStreet classic : Tomahawk steak with roasted bone marrow, chimichurri and red wine jus or braised short rib, or a divine slow cooked lamb shoulder with pumpkin hummus, dukkah and sage butter. However, the menu changes with the season so prepare to be surprised. Listen, I could go on and on about the food, but I need to tell you, 5thStreet has a wonderful wine menu, paired with a rotation of craft beers on tap and of course Ezra is the main geezer with the squeezer, if you want to get in the mood with a cocktail or two. Dining is fab, but remember you can hit 5thStreet for a bar + snack + cocktail adventure. Or just to hang on your own and catch the vibe, you don’t always need a tribe. 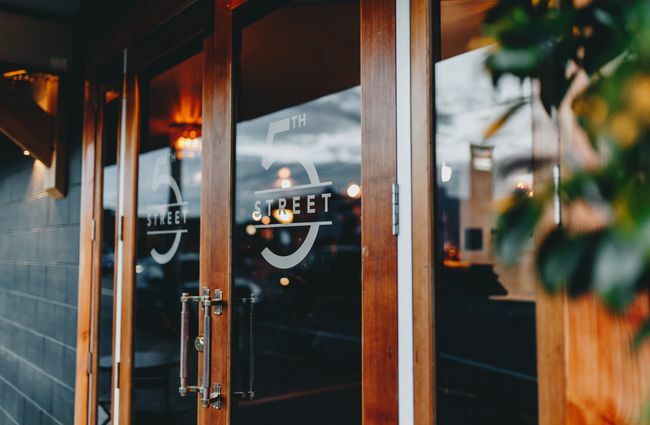 In the meantime enjoy, post quake, 5th Street is the face of dining in this new Christchurch, thank you Mother Nature…. for some things, of course you know best.